Here's another noodle I made for the 24 / 7 event 7-13 june 2010. This one doesn't generate any sound by itself, instead it sends MIDI events to an external synthesizer. In the case of the 24 / 7 event on friday 2010-06-11 I had it playing a Kurzweil ME-1 rompler. It plays notes (note on/note off) on midi channels 1 and 2, and it sends program changes every now and then, changing what sound is played on both channels. I'm attaching some images of parts of the patch that I'll try to explain here. Sequencers: here you see four gate sequencers. Each of these contain a very basic rythm, that you might find in parts of simple melodies. The first is just one strike per semi-note (could be quarter note, perhaps - I'll go with semi). The second is also semi-note strikes, but it's shifted a quarter note so it makes a backbeat in relation to the first sequencers. The third starts with a dotted quarter note, and continues with half notes, making up another shifted sequence. The fourth and last combines the first and second sequences. All of the sequencers advance at the same pace, being clocked by a LFO. These go into a mux that at any time will be letting one of the sequencers through. The mux changes which one it lets through each time the sequencers advance a step. The idea is that I will get a random rythm that tends towards some beat timings that I tend to use when playing melodies normally. To the right of this arrangement are eight module pairs, each consisting of one clocked random module going into a note quantizer that quantizes to the C-major scale. All of these are clocked by a slow random LFO, meaning they will stay in a configuration of eight tones for a while,then change to another maybe twice or thrice per minute. note generator mux: These eight tones are used to make up sequences. There are four MIDI tone senders. At the top of each of these is a mux were the eight notes go in. Anytime a MIDI sender sends a tone, it picks a random note from the mux and sends that. A random trig module is trigged from the mux-processed beats I described at the beginning here. It will cause the MIDI send module at the bottom to actually send a note approximately every second time a pulse is sent from the sequencers. Since there are four note senders each picking up every beat from the mux, there's a good chance that at least one of them will play its note. This causes single notes and chords to appear in a random fashion, but since there is always a limited amount of notes to choose from (the eight at the top that change a few times per minute), there will be some repetition on the tones. All of this aims at causing something that is random, but with repetitive moments. I feel that you need some repetition to establish something that is enjoyable when you are working with clear tones that are in key, but you need it to change every now and to not become too boring to listen to. 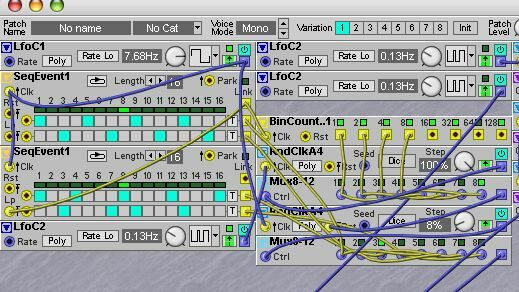 This noodle sends midi notes to an external synthesizer, but it can also be used for some random processing and fading in and out of the resulting sound. Just plug in the external synth into inputs 3 and 4, and use the output from the G2. The whole noodle with sound processing needs an expanded G2, but if you're only interested in the MIDI sending bits you can delete everything in slot C and D (there is a copy of the MIDI sending stuff in the top of slot A in the bottom of slot B, sending to another MIDI channel). By the way, I think I ran into a bug in the G2 when fiddling with this. I wanted to synchronized the sequencers in bottom slot B with the ones in top slot A, by piping the LFO in A into bus 2, and taking that into slot B. But when I disconnect the lfo at the top left in bottom slot B, and then take the output form bus 2 (bottom left in slot B), the slot goes up to double the CPU (ca 185) and stops! I don't find that reasonable.